Instead of starting with the cooking steps, I’m going to jump to the end and say that these were fantastic! Joanne’s recipe is very easy to make and her combination of ingredients is hugely flavorful, with lots of sweet from the Vidalia onions and roasted red peppers, a little bitter from the spinach, and plenty of salty from the ricotta salata. Since all the ingredients were basically at room temperature by the time we assembled the crostini (we let things sit for a little bit as we finished our pre-dinner cocktails), we decided they would be perfect to serve to guests because you can make everything in advance. 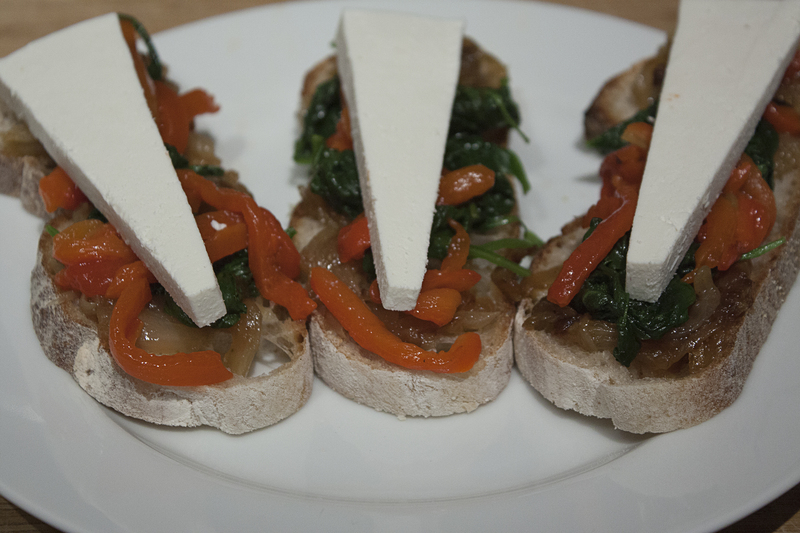 Plus, everyone has the fun of assembling their own crostini. 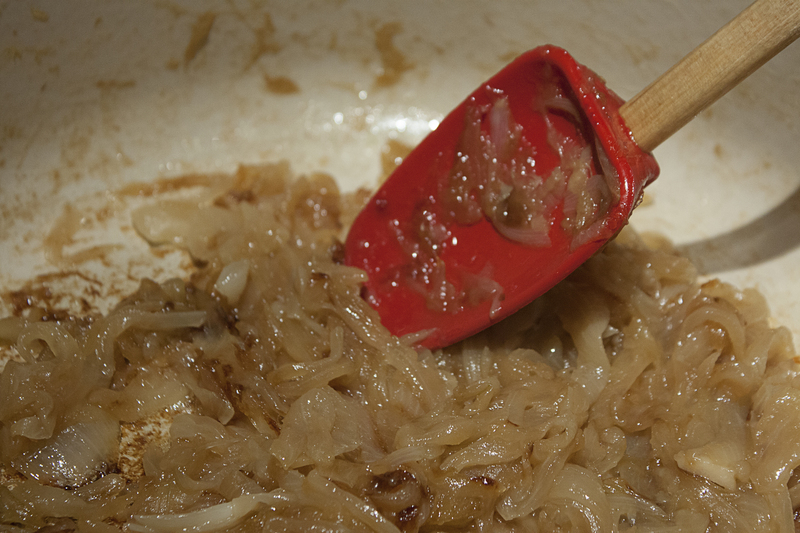 If you’ve done the math, you’ve figured out that the onions spend 50 minutes on the stove. This seems like a long time, but keep in mind that this is not a labor-intensive recipe. 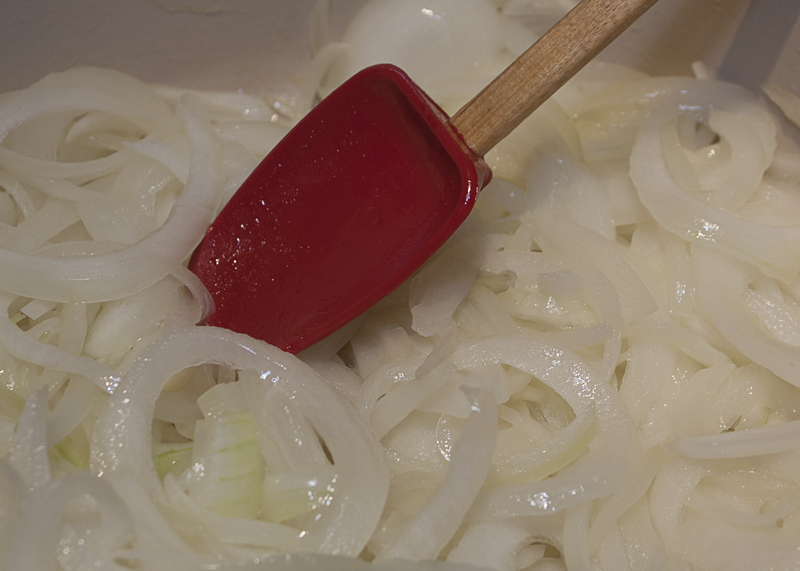 You don’t need to do much to the onions besides stir them occasionally and add a little salt and pepper at the end, so you can easily use the 50 minutes of cooking time to clean up and get other things ready. For example, during the first 20 minutes, I sliced the red peppers, as I wanted them to sit at room temperature for a while so they could warm up after coming right out of the fridge. I also used the time to (very carefully) wash the mandoline and help Kim mix up a batch Vespers, cocktails made with Lillet, gin, and vodka. During the final 30 minutes, I got out the bread, sliced the ricotta salata, wilted the spinach, set the table, poured the wine, and finished my cocktail. 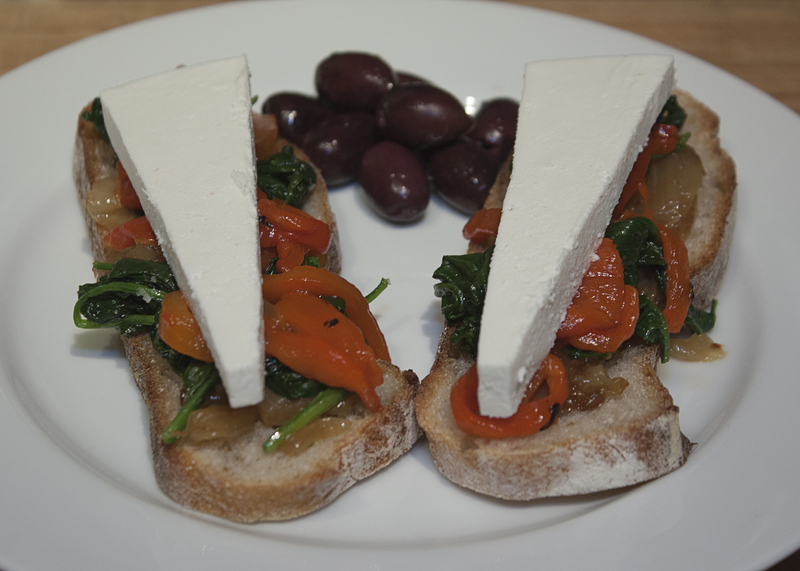 Assembly was easy, as you just layer some onion, then some spinach, then some roasted red pepper on the bread and top it all with a slice of ricotta salata. We added some Kalamata olives on the side and had a wonderful, simple, delicious dinner, thanks to Joanne and her Eats Well With Others blog!